..... Balance Trading .....: Are Bulls Back? As of close of Friday, three (DJI, SPX and RUT) of five major indices (3 mentioned plus NAZ and DJT) are trading above their PDL-0. That is bullish and at this point chances are good that major indices continue their rally for a while. Shorter term, however, indices are quite overbought and chances are good that indices sell off early next week before resuming their advance higher. 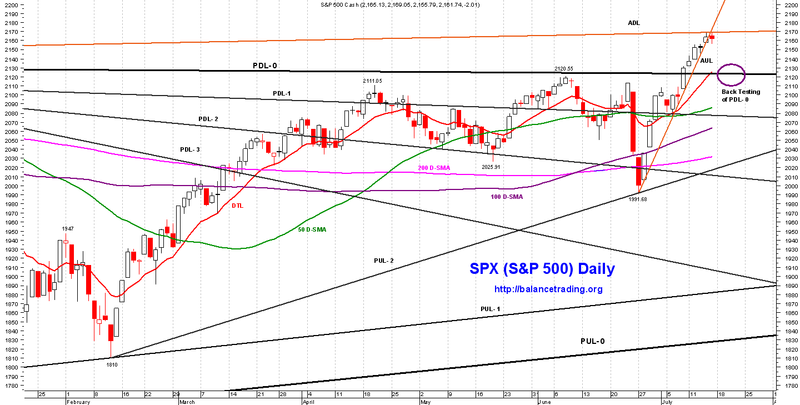 For SPX, shown above, chances are good that we see a sell off to back test PDL-0 around 2130 to 2110. I'm going to be watching SPX to see how it trades in that 20 point support range and make a decision as to opening long positions. Last week on Monday, SPX closed at a new all time high. Per my plan I covered my short positions on Tuesday. 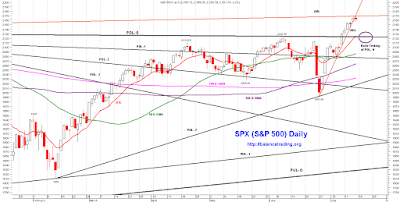 I'm in cash and looking for to open new my first of three long positions in SPY as SPX sells off to back tests its PDL-0 probably early this coming week.